Over two years since suffering severe frostbite I was back climbing in the mountains. I summited the Allalinhorn which stands 4027m high, climbed the 200m near vertical Chere Couloir, and scrambled over the Arete du Cosmiques…. After suffering severe frostbite on Mt. McKinley in May 1999, many people thought that I would never climb again. My fingers and toes were beyond repair, and amputations followed, changing my entire life. Yet early on in my recovery I was determined that no matter how severe my injuries were, they would not stop me from returning to the mountains that I love. Since that day I have been learning again the skills needed to climb. It has not been an easy task and I have suffered both physically and mentally, but I have finally got back into the heights, and come to terms with my injuries. There is still a long way to go, but I hope eventually to make a full enough recovery to return to the world’s great ranges and climb above 20,000ft again. I must thank all my friends and especially my family for understanding my wish to climb again. Because of my injuries I cannot expose myself to sustained extreme cold, or poor mountain weather conditions as my scars feel the cold more than ever now, and I must protect them from further damage. The Alps offer the excitement of a large mountain range, but they also allow you to retreat to secure mountain huts at night or in poor weather conditions. The Alps provide quality climbs of one or two days duration, whereas in the world’s greater ranges it may take weeks to access certain peaks. Rescue is more reliable and organised than in many other parts of the world, and the summer temperatures, even in the mountains were safe for me to climb in. All these factors allowed me to climb on challenging routes whilst working with my frostbite injuries. It is said that Alpinism began in 1854 when Alfred Willis climbed the Wetterhorn. Over the next ten years almost every peak over 12,000ft (3650m) was climbed. 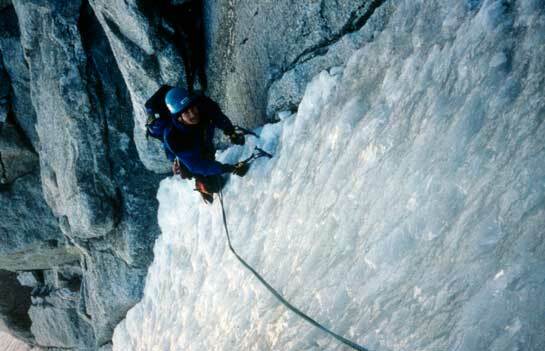 Many people’s images of alpine climbing is still of men clad in tweed suits, cloth caps, hob nailed boots and hemp rope, climbing snow-covered mountains. Technology has introduced new clothing and equipment, but two important factors have not changed – weight and speed. Because many peaks have to be climbed in darkness so as to prevent injury from melting ice and falling rocks, speed is a critical factor. Alpinists are renowned for their lighting pace on the mountain, which means they travel light. Many mountaineers across the world prefer this method of climbing, but it does bring with it a set of risks. If bad weather comes in and you cannot escape, you may not have all the equipment you need to withstand it. It is a risk you take. It is well known that the human body begins to suffer due to lack of oxygen at an altitude of around 10,000ft. The symptoms vary widely and can range from lack of appetite to severe headaches and nausea. With correct acclimatisation most people can quickly adapt and move to higher altitudes. The Alps, unfortunately, offer plenty of opportunities for poor acclimatisation because of the common use of mountain railways and cable cars to gain significant height in a short period of time. It is common to see people struggling for breath at a summit station when they exert themselves after rising 8,000ft in half an hour. Fortunately many are tourists visiting for a few hours before returning to the valley, but for a climber a few days spent living around 10,000ft is a must before moving on to climb a peak. Going back into a mountain range brought with it a dangerous fear of the past. Nightmares had been disturbing me for weeks and I felt truly scared to face the ghosts which lingered in my mind. I found that gazing silently over the jagged snowy peaks and tumbling ice glaciers helped me come to terms with what had happened to me, and allowed me to face my future with increasing confidence. Being with other climbers helped restore my confidence, and allowed me to talk about my frostbite with other people who had suffered similar injuries. Conquering my fears of the cold and high altitude is half the battle for me now when I climb, and I know only too well what nature can do to the human body. I don’t want to feel it’s icy grip so deeply again, yet for me climbing is now more of a passion than it ever was, and I intend to climb higher and further as my recovery completes. Months before my climbing trip I decided to find out what the Alps were like in times past. Searching through a second hand bookshop I found a dusty old copy of “The Alps” by RLG Irving. It was written at the outbreak of World War Two and describes the Alps at a time of great change. Not only because the outbreak of war had changed national borders, but also because of the increasing accessibility of the Alps, and the new tools which were making previously impossible climbs possible. Many villages still had no road access, and people lived traditional lives not venturing out of their home valleys. The first rock climbing equipment was appearing in the form of pitons and karabiners, allowing first ascents of difficult rock and ice faces. I carried the book around with me on my travels to compare the past with today. The Alps have many huts situated high in the mountains for the use of climbers, walkers and skiers. Most were first established in the 19th century by climbing clubs keen to push the boundaries of alpine climbing further. 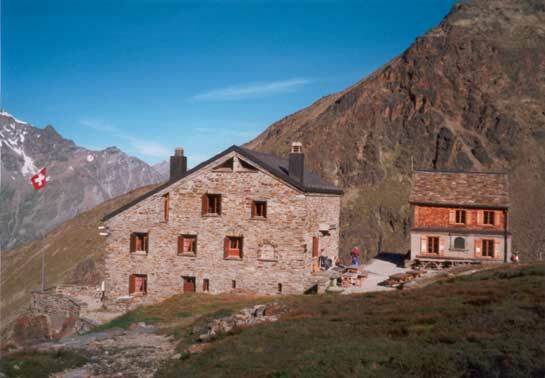 The word ‘hut’ may be an understatement as most are well-equipped mountain refuges with comfortable beds and hot food. They offer the traditional ‘Alpine Start’ to the day of early wake up call and breakfast, before climbers make for their chosen peak. Originally supplies were manhandled onto the mountain, but the invention of the helicopter has been a great bonus for both re-supply and waste disposal. Being in such an important ecological position many huts have solar powered lighting, waste recycling facilities and promote a clean mountain environment. My first major alpine challenge was to be the NE ridge of the Allalinhorn, one of the top 100 classic alpine climbs of all time. 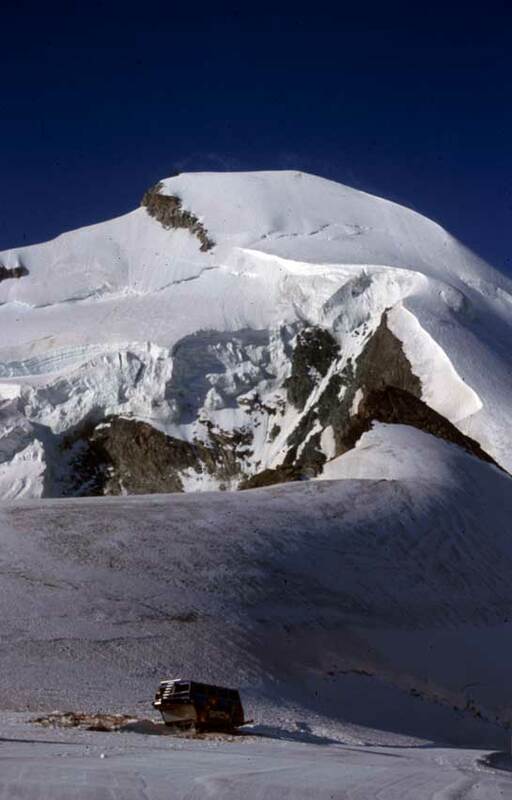 The Allalinhorn stands at the head of the Saas valley and at 13,200ft (4027m) I found it a major challenge. The NE ridge rises 1300ft (400m) over hanging seracs and steep snow slopes all the way to the mountains summit. Even though I was well acclimatised I felt the thin air bite into my lungs. I climbed slowly and steadily, allowing my breath to return until after two hours of almost non-stop climbing I stood on the summit. It was a wonderful moment to be back on top of a mountain again. Around me were dozens of peaks all towering above the valleys with their snow-clad summits pointing skyward. 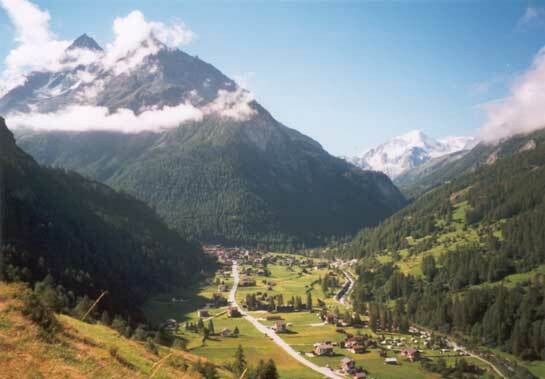 Below was the village of Sass Fee, where my climb would end with a well-earned celebratory drink. For the past few years ice climbing has become for me a passion, but losing your toes makes ascending the near vertical frozen ripples of ice almost impossible. Standing in solid boots with stubby feet can be incredibly painful, but it is possible. I had tried climbing routes in Scotland with varying degrees of success, but I needed the challenge of a hard altitude route to truly return me to the sport I love. At 660ft (200m) tall and at 11,800ft (3600m) above sea level the Cherie Couloir was a challenge indeed. The ice was hard, and the route was near vertical. I smashed my axes deep into the ice and moved slowly, but steadily upward. My feet ached with pain as the wounds were rubbed and battered, but nothing was going to stop me finishing the climb. I sat at the top overlooking the glacier below and shed a few silent tears of joy. I could still climb! Rising from the Abri Simond to the Aiguille Du Midi is the rocky Cosmique Arête. At just over half a mile long it is a complicated rock scramble mixed with exposed snow slopes and icy verglace. My final test in the Alps was to be a difficult one. Fresh snow had fallen overnight, and cloud ran against the Arête reducing the visibility. The rock was cold and at times unstable, but with persistence I moved along the route, rope length by rope length until the first abseil where I dropped 60ft into the first col. Here the snow made climbing difficult as without crampons your feet cannot grip onto its icy surface. I moved on dashed by the wind and cloud over the final scramble until I climbed the metal ladder onto the viewing deck of the cable car station. A few tourists gathered around and took many photographs, but they didn’t interest me. I had climbed a good alpine rock route and survived unscathed. Though my alpine climbing may have been a success I still have to be careful as to what I subject my body to. Though I would dearly love to return to the world’s greater ranges I have to realise what the elements can, and have done to me. The cold bites deep into my hands and feet, and further damage would be disastrous. I will remain susceptible to extreme cold for some time yet, though set timescales cannot be put against my medical recovery. Over the next few months I must contemplate my future in high altitude mountaineering, and see what I can do safely without the risk of severe injury.